Happy new year! This is the first release of this year. This release introduces Home Fragment that changes the way to select the fragments shown at the home page. 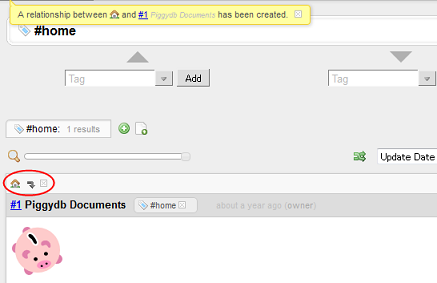 In the older versions, fragments with a #home tag will be shown at the home page. However, this feature has some disadvantages. For example, you can’t put a tag-fragment without the side-effect where the tag-fragment will inherit #home’s feature unexpectedly, which means the fragments tagged with the tag-fragment will also be shown at the home page. Also you can’t control the order of the fragments at home page with #home. So, the old #home tag has been replaced with Home Fragment whose child-fragments will be shown at the home page with the order maintained. The following is the steps to replace your #home tag with Home Fragment. It will be a matter of seconds. In that page, you can view all of the #home tagged fragments. What you need to do is just to click on the “Add this fragment to home page” button for each of them. That’s it. Another change in this version is the way to open the content of a fragment. You can do that by clicking on the header of a fragment, not needing to click on the tiny toggle switch anymore. Yes. Your database will be upgraded automatically as long as you upgrade to newer versions.